SANTA CLARA, Calif. — SonicWall, the trusted security partner protecting more than 1 million networks worldwide, announces an unprecedented range of advanced network security products and services that accelerate speed thresholds for its Automated Real-Time Breach Detection and Prevention Platform across wired, wireless and mobile networks. The platform enhancements include more than 50 new SonicOS features, a new high-performance firewall, a series of new 802.11ac Wave 2 wireless access points, an intuitive cloud analytics application and advanced secure federated single sign-on (SSO) capabilities. With more than 50 new features, SonicOS 6.5 is the biggest customer-driven release in SonicWall history. Highlighted by a modern, intuitive interface, SonicOS offers advanced networking and connectivity capabilities to optimize system availability, while scaling firewall performance to deliver uncompromised, uninterrupted threat protection for all connected networks. The operating system includes improved threat API capabilities to help businesses build automated security platforms that can leverage third-party threat intelligence feeds. SonicOS 6.5 also features a suite of wireless features that enables security and connectivity for mobile users. Multi-domain authentication support also provides a simple and fast way to manage and enforce security policies across an entire organization. 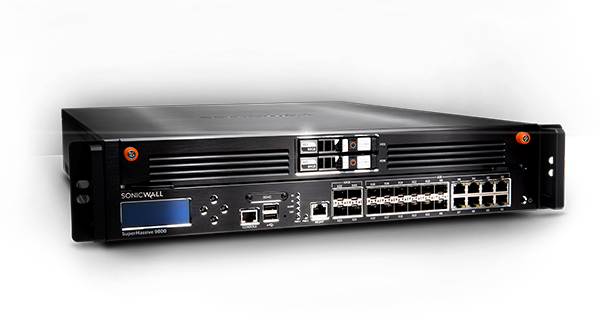 Core to the platform expansion, SonicWall is unveiling the new SonicWall Network Security Appliance (NSA) 2650 firewall, which delivers automated, real-time breach detection and prevention, as well as TLS/SSL decryption and inspection, over multi-gigabit wired and Wave 2 wireless networks. The NSA 2650 appliance is the first branch and campus firewall to support both multi-engine sandboxing via the Capture Advanced Threat Protection (ATP) service and full deep packet inspection of TLS/SSL-encrypted traffic for 2.5G wired and 802.11ac Wave 2 wireless networks. With eight 2.5G Ethernet interfaces and 20 total ports, the NSA 2650 matches network throughput between multi-gigabit wired and 802.11ac Wave 2 wireless networks. Compared with the previous-generation NSA 2600 appliance, the NSA 2650 supports twice the number of DPI connections and offers 12,000 DPI SSL connections, an increase of 12X. To complement the NSA 2650 appliance, the new SonicWave series of access points meets the 802.11ac Wave 2 wireless standard, which features 4x4 MU-MIMO technology for best-in-class Wi-Fi performance, range and reliability. Leveraging a powerful intelligence-driven engine, SonicWall Cloud Analytics is a new cloud application that is delivered as a service to customers and partners. It provides deep real-time visibility, insight and alerting for network traffic, user behavior and device activity from a centralized dashboard. SonicWall Cloud Analytics empowers organizations to monitor, record, analyze and report security data for deep forensic analysis across multiple SonicWall firewalls and SonicWave wireless access points. SonicWall Cloud Analytics — featuring real-time data presented in a structured, meaningful, actionable and easily consumable manner — enables security teams, analysts, auditors, boards, C-suites, and stakeholders to discover, interpret, prioritize and take appropriate defensive actions against both known and unknown cyber attacks or threats. To extend SonicWall security from wired and wireless networks to remote users, SonicWall Secure Mobile Access (SMA) 12.1 provides secure, policy-enforced access to email, file servers and corporate applications using federated SSO to both cloud and on-premise resources from authorized devices. To defend corporations and security-conscious organizations against advanced cyber attacks, SMA now scans all file uploads with the SonicWall Capture ATP service, a cloud-based, multi-engine sandbox designed to discover and stop unknown, zero-day attacks, such as ransomware. This real-time sandbox approach ensures users have the same level of protection from zero-day threats when they are on the road as they have in the office. For North American and European customers, SonicOS 6.5, NSA 2650 firewall and the SonicWave series of wireless access points are available immediately. SMA 12.1 and Cloud Analytics will be available in early Q4 in North America and Europe. For availability in other regions, please contact your local authorized SonicWall distributor for details. SonicWall has been fighting the cyber-criminal industry for over 25 years, defending small, medium-size businesses and enterprises worldwide. Backed by research from SonicWall Capture Labs, our award-winning real-time breach detection and prevention solutions, coupled with the formidable resources of over 18,000 loyal channel partners around the globe, are the backbone, securing more than a million business and mobile networks and their emails, applications and data. This combination of products and partners has enabled an automated real-time breach detection and prevention solution tuned to the specific needs of the more than 500,000 organizations in over 150 countries. These businesses can run more effectively and fear less about security. Abtech Technologies is a leading SonicWall partner. Our engineers are fully certified in SonicWall technology. We can design, implement and support any SonicWall solution to meet your security needs.